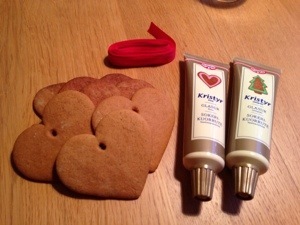 When we bake gingerbread cookies I always make a few special ones that I can use and decorate my kitchen window with. I’m a little lazy though as I buy pre made colored icing. They are so easy to use as I don’t need all the mess that comes with a icing bag. I’ve recently bought a new one that seems much better than most so next year I might just do the icing on my own. 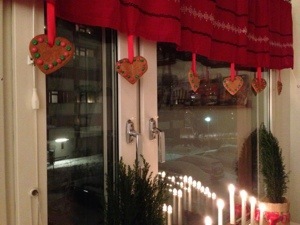 It’s very easy to make your own cookies to hang in the window. Just make the dough (or buy pre made), use whatever cookie cutter you desire, and then bake them. Remember to cut out a hole before baking. 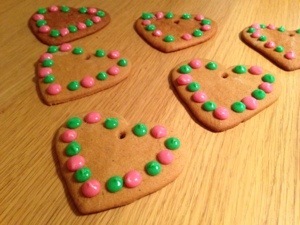 When the cookies are cold decorate them with icing of you choice and maybe even some candy. Let the icing dry and then take a ribbon and hang them in whatever desired located. Now you have a pretty window/wall!